"Interviews with a variety of pro- and anti-Wasserman Schultz Democrats—and there are plenty of both—suggest that the Florida House member's problems were both personal and structural, and that she retains a relatively bright future even if this chapter of her political life left much to be desired." From the Washington Post. 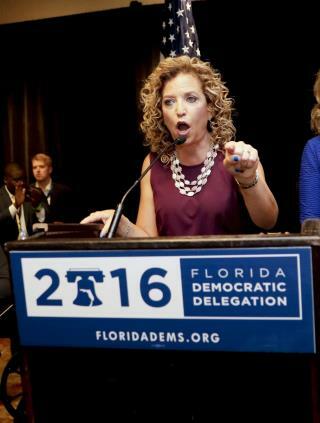 The idea of ousting Wasserman Schultz had been broached last fall, but President Obama didn't want the headache. So reports Politico in a story detailing her strained ties with the White House and Democratic establishment. A post at the Nation makes the case that she was too divisive to remain in the job, even if the email leak hadn't happened. Were the Russians behind the email hack as part of a plot to help Donald Trump? The New York Times looks into the intrigue—and the difficulty of proving anything. Who's next? Politico's Playbook blog lists the top contenders to take over the DNC post, with Stephanie Schriock, president of EMILY's List, at the top. Vox has an explainer on the original posting of 20,000 DNC emails by WikiLeaks. JOHNSON / WELD FOR PRESIDENT . The Democratic Party has totally betrayed the Voters of this country. The Chair of the Convention circumvented a fair election and was rewarded by Hilary Clinton with a place in her Campaign. Done. Sincerely Former Democrat now Independent. Among other things, not surprising to see Schultz pointing. Reminiscent of Bill Clinton. An evident method of Liberal party operation, based on their tactic of appealing only to those who will willingly let themselves be pointed at contemptuously and told what to think. Unsurprising that other, supposedly unrelated situations for Schultz will be blamed for what is happening. Although there was no real mention of any of these things before. The attempt to blame the Russians for the leaking of Schultz's craven machinations seems very much in line with arrested development sentiments Liberal party target audience members maintain. In this case, it's not Schultz's fault for being a malingerer, it was the Russians' fault for revealing it. Also not surprising, Schultz using invocations like “linking arms” and “not standing down” to describe her refusing to take responsibility for her own rottenness.